Ceiling elements are individual pieces that can significantly enhance a rooms decor. The range consist of ceiling domes, ceiling rims, ceiling medallions, both elliptical medallions and non-elliptical medallions, and rosettes. Ceiling rosettes and ceiling medallions are not just exclusive to ceiling decor - they can also be used creatively as wall accents and wall decor. 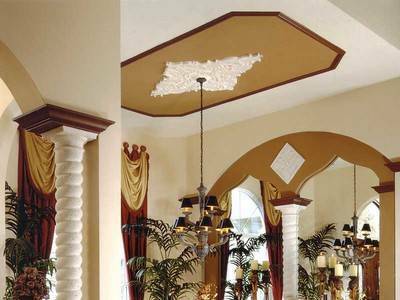 There are variety of different decorative moldings. Our largest range consists of crown moldings which can be used as either decorative exterior crown moldings or decorative interior crown moldings. 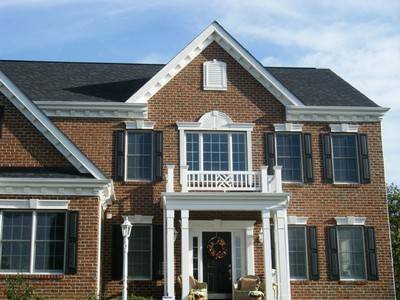 Most crown moldings can be made in flexible material for specific project requirements. 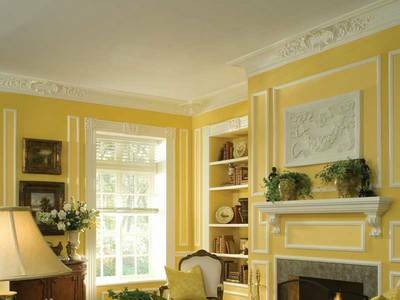 In fact, most mouldings we offer can be custom made for projects that require flexible molding. We have a category of pre-formed rigid flex that may work, while almost all other profiles may be ordered as custom flexible mouldings. In addition to the crown moldings, there is a wide range of chair rails, casings, fascias, and friezes, as well as panel moldings and baseboard moldings. Certain molding profiles can be customized with dentil trim and we also carry a line of miter free moldings that can be used with molding blocks, such as Focal Point's Quick Clips molding installation system and Focal Point's Moulding Mates. Also available are wide range of flat trim that can be used for many different applications. Decorative line of products for both exterior and interior entry systems and window systems. A full line of entry systems consisting of pilasters, plinths, capitals, crossheads, pediments, transoms, and crosshead pediment combinations. Window systems consists of arch window trims and oval trims, window headers, window shutters and window panels, along with all window system accessories. Adjustable window headers are also offered for simpler installation. Compatible keystones for window headers and overdoors are available to enhance the appearance of both door and window systems. Offering a full line of structural load-bearing columns and decorative column wraps and covers. Our line consists of a wide range of round tapered and non-tapered columns, round fluted columns, square fluted columns, square recessed columns and round twisted columns. To enhance your decor add the perfect balance of architecturally detailed recessed column wraps, raised column wraps, fluted column wraps and simple plain column wraps. Column crowns and bases are also available to enhance the detail of all columns. 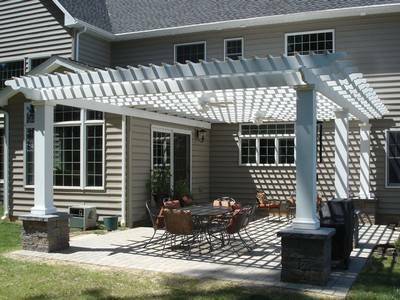 All architectural elements to complement both exterior and interior decor. A large collection of corbels and brackets for both exterior and interior use. Niches for standard walls, surface mount niches, and larger niches with niche caps. Shelves and mantels for artful display of frames and collectibles. Decorate stair cases with a wide collection of stair brackets, available for both right and left configurations and also in flex! Highly detailed decorative accents that can be used as wall accents and appliques for both exterior and interior use. Dentil blocks to enhance the exterior of a building. A wide range of louvers in multiple sizes to meet specific requirements and available with screening to allow for functional and ventilation use. A complete line of gables that can be coordinated with a range of finials creating the exact architectural detail desired. For the Do-It-Yourself, these decorative home kits simplify your DIY projects by providing you with the parts necessary to tackle projects from entry ways to entire crown packages for rooms of various sizes.